Sometimes when it’s winter we feel that our faces are dry. Well as I Know my face can be more dry in the winter times. So I tend to look for stuff that would help my face including sponges or washcloths. 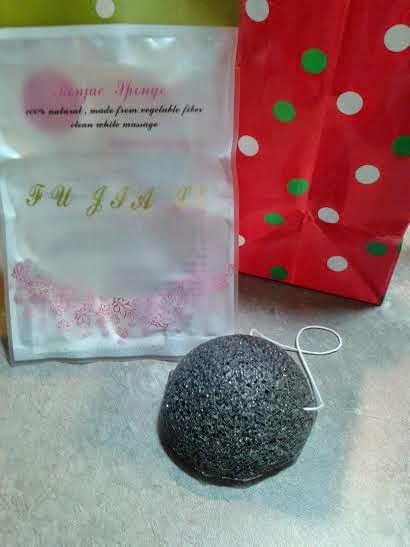 So at this time I am using this round charcoal Konjac Sponge. *Gently exfoliates to bring the natural glow of the skin. I am very please with this sponge. I have used it with my face wash and also without it. I love the texture and the size. I usually wet it but I don’t let it soak like a blah sponge, I soak it as much as I want and then I message my face with it. It has no odor to it which is good. It exfoliates my face nice and leaves it smooth. I like that because its a round top and a flat bottom I can adjust the sponge in my hand to use it in every part of my face and I use it more on my T- zone which is the driest.